I will start by saying I am a harsh critic, and while there were some issues, overall, I had a fantastic time and Royal Caribbean deserves all of the credit for it!! I went on a girl&apos;s vacation with my mom and sister (mom in 60s, sister and I in late 20s/early 30s respectively). This was the first time my sister and I had been on a cruise and I must say we are now addicted!! We spent 2 days at Disney before the cruise, but the transportation (Mears Transportation) from Disney to Port Canaveral was great! Wonderful and knowledgeable driver and knew exactly where to go at port. Embarkation only complaint is that we did not realize that we could bypass the big line due to being in a suite. Once we got to the building, we bypassed the rest of the line and went straight through security. Check-in and all was a breeze from there! The ship was spectacular! Huge. Beautiful. Clean. I really liked that they all but forced sanitizer to everyone as you boarded and there were sanitizer stations everywhere, especially at every dining facility. At the Windjammer (the main buffet dining), they sanitized everyone upon entering! Definitely helps to keep the sickness off ship. We explored the ship (some) before going to our room. We had a grand suite which had a King bed (or pull apart to 2 twins?) and a pull out couch. I slept on the couch and slept fine and I have back problems. 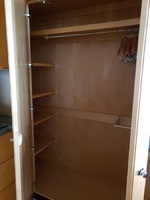 We had a beautiful &apos;kitchenette" (it was an island with a mini fridge, a long closet that held all 3 of our clothes, a mirror on each of the closet doors, and about 6 drawers for storage). 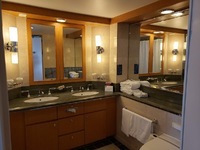 Our bathroom had a double sink and a bathtub!! After walking around port all day, soaking in that bathtub was amazing!! Our concierge was very nice and informative - we left him a good (cash) tip! We had what was a double balcony I think. It had 2 nice lounge chairs and a table with 2 chairs. We ate breakfast out there on port days. Only complaint about the room is that our safe battery died so it quite working with our passports etc in there, luckily it was a cruising day and when we called about it someone came down within 10 minutes to fix it! Food was AMAZING and I am Gluten Free and always found food to eat. Windjammer was great. Main dining room food was great. A few of our waiters did seem a bit overworked and busy. We were on board over Thanksgiving and had a full ship, so maybe that had something to do with it. Otherwise, it was a good experience. Pizza place was open until 2 or 3am which was great! And when I told them I was gluten free, they made me a whole pizza in about 10-15 minutes!! It was included in the price for the room so I did not have to pay anything extra! Most of the time, the drinks at the pool could have been a little bit stronger, but i did find a few bartenders who made theirs stronger ;) We saw the broadway Cats, which was, a little boring (I really wanted to see it because I love musicals, but was dissapointed a little - but it is an old classic broadway play so that is what you get). Disappointment was due to the plot. The actors were entertaining and wonderful! Come Fly With Me was fantastic! Oh, and the ice show--they did such an amazing job especially considering that they are on a small ice rink and the ship was really rocking that night Ice skating is a very precisional sport, so they were definitely talented to do that while the ship was rocking. Comedy was awesome (I got called out by the headliner, lol). Be aware, I was at the adult show, and when they say adult, they mean adult, but we loved it! My sister really found a new hobby of art collecting while on board through attending the art auctions! 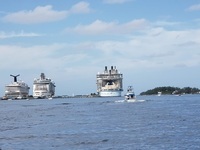 Ports of call: Nassau, Bahamas we did the Sea and See Island tour. The sea part was great as we took a boat tour of the bay (the guides were hilarious and pointed out celebrity homes). Then we switched to another boat out in the water that was like a glass submarine underneath. We got to see a lot of different colored fish, sea grass, etc, and we even got to see a sea turtle! The See part was a van ride up to the Queen&apos;s staircase and the Fort. We only had 20 minutes and spent some of that time using the facilities. Staircase was great to see but didn&apos;t get enough time to go down and back up. Port of call: Charlotte Amalie, St. Thomas - We went on the 5 Star Island Tour. We went on a trolley like truck on a scenic view up the mountain to Mountain Top. They have the world famous banana daiquiris. If you love bananas, get one, just trust me! 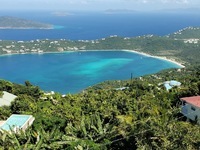 We went out on the balcony and saw a panoramic view of St. Thomas - Gorgeous!! We could see the world famous Magen&apos;s Bay beach. Then we drove down to Magen&apos;s Bay beach and spend 2 hours there. I am not a water person, but i got in the water there up to my neck and could still see my feet!! White sand beaches, though it was packed that day as there were 3 or 4 cruise ships in port that day. After that, we went into town and did some shopping! Port of Call: Phillipsburg, St. Maarten. What can I say about this place, but I fell in love with it! I want to fly down there and spend a week! The people were incredibly friendly and the place was beautiful and not rundown like St. Thomas was some. Trust me, St. Maarten was worth it! We did the Amazing Race excursion which I highly recommend if you are even just a little competitive. We had some issues communicating between the 3 of us, or it would have been even better. But we really enjoyed it. Keep in mind, you are running at times around town but they do force everyone to take a water break at midpoint which was nice. Overall, I truly enjoyed Oasis of the Seas. It was clean, though you could tell some of it needed some refurbishment, but it is set to go into dry dock just for that in 2019. I would love to go on it again after it is refurbished to see how it could possibly get any better! I am seriously planning my next Royal Caribbean cruise already and I have only been home a month! Our closet...that was half of it. 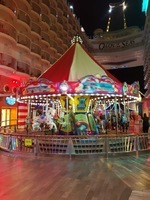 The Boardwalk on the ship! 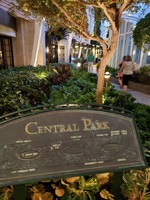 Central Park on the ship, and yes, those are real tress and plants! I will start by saying I am a harsh critic, and while there were some issues, overall, I had a fantastic time and Royal Caribbean deserves all of the credit for it!! I went on a girl&apos;s vacation with my mom and sister (mom in 60s, sister and I in late 20s/early 30s respectively). This was the first time my sister and I had been on a cruise and I must say we are now addicted!! We spent 2 days at Disney before the cruise, but the transportation (Mears Transportation) from Disney to Port Canaveral was great! Wonderful and knowledgeable driver and knew exactly where to go at port. Embarkation only complaint is that we did not realize that we could bypass the big line due to being in a suite. Once we got to the building, we bypassed the rest of the line and went straight through security. Check-in and all was a breeze from there! The ship was spectacular! Huge. Beautiful. Clean. I really liked that they all but forced sanitizer to everyone as you boarded and there were sanitizer stations everywhere, especially at every dining facility. At the Windjammer (the main buffet dining), they sanitized everyone upon entering! Definitely helps to keep the sickness off ship. We explored the ship (some) before going to our room. We had a grand suite which had a King bed (or pull apart to 2 twins?) and a pull out couch. I slept on the couch and slept fine and I have back problems. We had a beautiful &apos;kitchenette" (it was an island with a mini fridge, a long closet that held all 3 of our clothes, a mirror on each of the closet doors, and about 6 drawers for storage). Our bathroom had a double sink and a bathtub!! After walking around port all day, soaking in that bathtub was amazing!! Our concierge was very nice and informative - we left him a good (cash) tip! We had what was a double balcony I think. It had 2 nice lounge chairs and a table with 2 chairs. We ate breakfast out there on port days. Only complaint about the room is that our safe battery died so it quite working with our passports etc in there, luckily it was a cruising day and when we called about it someone came down within 10 minutes to fix it! Food was AMAZING and I am Gluten Free and always found food to eat. Windjammer was great. Main dining room food was great. A few of our waiters did seem a bit overworked and busy. We were on board over Thanksgiving and had a full ship, so maybe that had something to do with it. Otherwise, it was a good experience. Pizza place was open until 2 or 3am which was great! And when I told them I was gluten free, they made me a whole pizza in about 10-15 minutes!! It was included in the price for the room so I did not have to pay anything extra! Most of the time, the drinks at the pool could have been a little bit stronger, but i did find a few bartenders who made theirs stronger ;) We saw the broadway Cats, which was, a little boring (I really wanted to see it because I love musicals, but was dissapointed a little - but it is an old classic broadway play so that is what you get). Disappointment was due to the plot. The actors were entertaining and wonderful! Come Fly With Me was fantastic! Oh, and the ice show--they did such an amazing job especially considering that they are on a small ice rink and the ship was really rocking that night Ice skating is a very precisional sport, so they were definitely talented to do that while the ship was rocking. Comedy was awesome (I got called out by the headliner, lol). Be aware, I was at the adult show, and when they say adult, they mean adult, but we loved it! My sister really found a new hobby of art collecting while on board through attending the art auctions! Ports of call: Nassau, Bahamas we did the Sea and See Island tour. The sea part was great as we took a boat tour of the bay (the guides were hilarious and pointed out celebrity homes). Then we switched to another boat out in the water that was like a glass submarine underneath. We got to see a lot of different colored fish, sea grass, etc, and we even got to see a sea turtle! The See part was a van ride up to the Queen&apos;s staircase and the Fort. We only had 20 minutes and spent some of that time using the facilities. Staircase was great to see but didn&apos;t get enough time to go down and back up. Port of call: Charlotte Amalie, St. Thomas - We went on the 5 Star Island Tour. We went on a trolley like truck on a scenic view up the mountain to Mountain Top. They have the world famous banana daiquiris. If you love bananas, get one, just trust me! We went out on the balcony and saw a panoramic view of St. Thomas - Gorgeous!! We could see the world famous Magen&apos;s Bay beach. Then we drove down to Magen&apos;s Bay beach and spend 2 hours there. I am not a water person, but i got in the water there up to my neck and could still see my feet!! White sand beaches, though it was packed that day as there were 3 or 4 cruise ships in port that day. After that, we went into town and did some shopping! Port of Call: Phillipsburg, St. Maarten. What can I say about this place, but I fell in love with it! I want to fly down there and spend a week! The people were incredibly friendly and the place was beautiful and not rundown like St. Thomas was some. Trust me, St. Maarten was worth it! We did the Amazing Race excursion which I highly recommend if you are even just a little competitive. We had some issues communicating between the 3 of us, or it would have been even better. But we really enjoyed it. Keep in mind, you are running at times around town but they do force everyone to take a water break at midpoint which was nice. Overall, I truly enjoyed Oasis of the Seas. It was clean, though you could tell some of it needed some refurbishment, but it is set to go into dry dock just for that in 2019. I would love to go on it again after it is refurbished to see how it could possibly get any better! I am seriously planning my next Royal Caribbean cruise already and I have only been home a month! Cabin was great! We had a bathtub and 2 sinks in the bathroom. A long ocean view balcony that seemed very private. Room was spacious. We splurged on the suite because we had 3 women in our room- and we all needed our space. The boat tour and underwater part made up for the rest. If we could have spent more time at the Queen&apos;s staircase, I would have rated it higher. I am in between a 3 and 4 stars here, but I am feeling generous, so I will give it a 4 but it should probably be a 3.5. What is there to say that is not good about Walt Disney World?! This was my 4th time there, but we were only there for 2 days before going on a cruise. The first day at Animal Kingdom and Epcot were great. Lines for Pandora rides were long - wait times were not accurate, but rides were enjoyable! Our second day there we went to Hollywood Studios and got to pretend like we were toys at Toy Story Land!Woody&apos;s lunchbox had a gluten free s&apos;mores option and it was incredible! Slinky dog dash was a line (of course since the whole land just opened 5 months ago), but it was WELL WORTH IT! Looks are deceiving with this ride! Magic Kingdom was of course, magical. Although, it was incredibly packed - shoulder to shoulder but it was the weekend of Mickey&apos;s 90th Birthday, so that probably had something to do with it. Lines overall weren&apos;t too bad, though a couple of the rides did shut down temporarily so we lost our fastpass for Winnie the Pooh and never got to ride it, but we did get to bypass the line for It&apos;s A Small World, so I guess it was a win-win situation! If you are slightly competitive, then do this excursion! It was a ton of fun to see the city of Phillipsburg and learn a bit about the history. It was exhausting, but definitely doable for all ages. There were even a few people with strollers, crutches, and I believe there was one person in a wheelchair, so definitely doable and they do force everyone to take a water stop and rest at midpoint. Highly reccomend! Amazing views of the island while driving up the mountain. The Mountain Top stop had an amazing panoramic view of the island and the world famous banana daiquiris. If you like bananas, then trust me and get one! We spent 2 hours at Magen&apos;s Bay beach which was beautiful with white sand and clear torquise water. I could stand in water up to my neck and still see my feet! Mind you, I am not a water person. We then got to shop in Charlotte Amalie which is always fun!